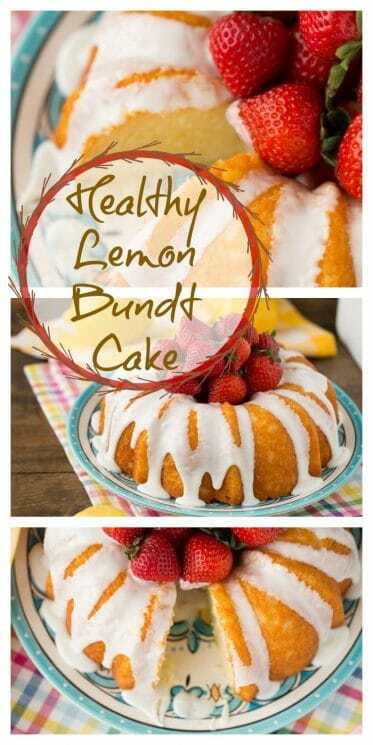 Healthy Lemon Bundt Cake with a zingy lemon glaze! All the flavor of a decadent cake with a few less calories for the new year! You and the kids will love this! The new year has come! So we’re bringing you cake! That make’s sense, right? Well after the holiday season of all things chocolate, peppermint, and over the top it’s wonderful to have a slice of citrus dessert. I can’t tell you how delicious this Lemon Bundt Cake is, the photos just don’t do it justice. We swapped out the butter for coconut oil, used honey and replaced half of the flour with whole wheat flour. You can use all whole wheat flour but I prefer the texture of half and half in baked goods. 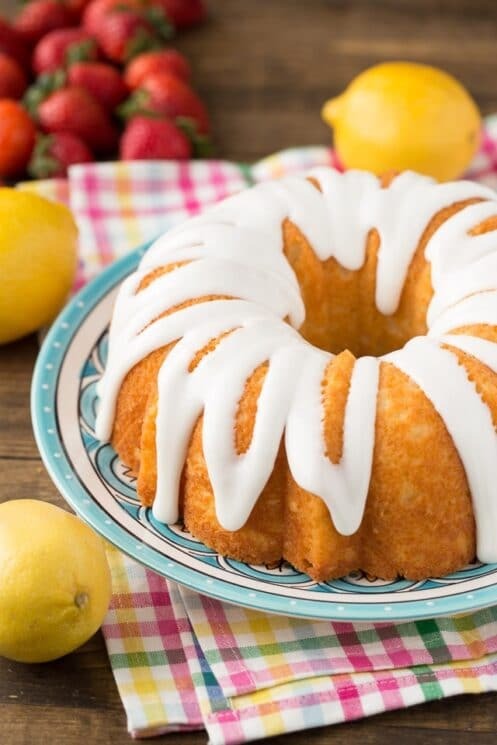 If you want to make this Lemon Bundt Cake even healthier, leave the glaze off! You could slice some strawberries and squeeze a little lemon juice on them. Let them sit in the fridge for 30 minutes. 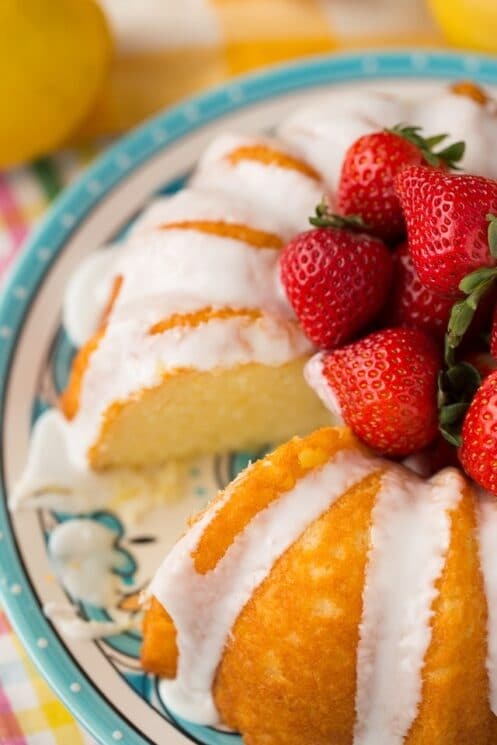 Serve the juicy berries with each slice of cake instead of the glaze. The cake is sweet enough without anything though! We love adding lots of fruit when we have dessert. 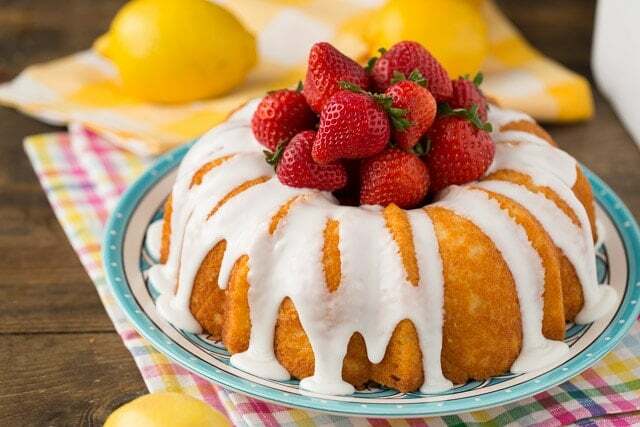 Bundt cakes are all about the presentation. There’s nothing more relieving than flipping a bundt pan over onto a plate and hearing that THUD. That means it came out perfectly and didn’t get stuck. It’s the silence after the flip that makes my heart drop. I always use a spray with flour in it when I grease my pan. When I use one without, my cakes always stick! There are several techniques for greasing you pans like buttering and then dusting with flour. Use what works best with you pan! Every Bundt pan is a little different and reacts differently with aerosols or butter. 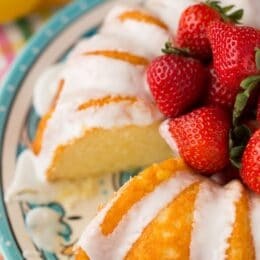 If you do have a cake that sticks, you can cover up a lot of flaws with a glaze and fresh fruit! So don’t panic! 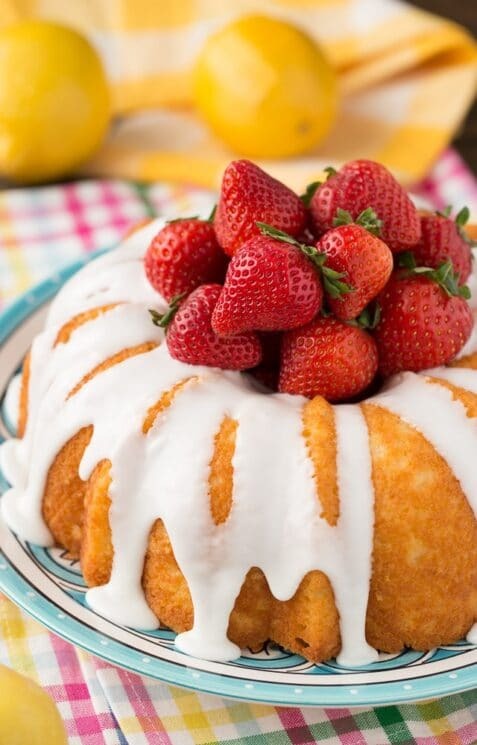 Back to our bundt presentation… Here’s the “naked” cake. And here it is with a lemon glaze. 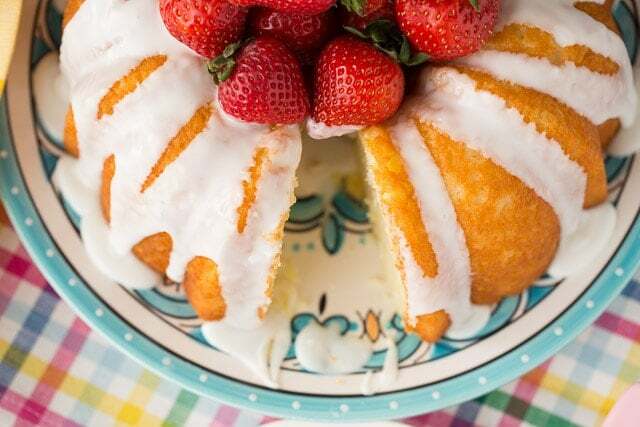 Add as much or as little as you want, you could even do a berry glaze! And once it has some fresh fruit in the middle it is a beauty! How can you resist? This is the perfect light dessert for a baby shower or kid’s birthday party. Add some sprinkles for an extra bit of pizazz! In a large bowl combine melted coconut oil, honey and sugar. Add egg, vanilla extract, applesauce, greek yogurt, lemon juice and lemon zest (peel). Stir. In a separate bowl, combine flours, baking soda and salt. Combine wet and dry ingredients and stir just until combined. Pour into prepared pan and spread out evenly. Bake for 40-48 minutes. Check part way through, if it starts to brown too much on top you can over the pan with foil as it finished baking! Bake until an inserted knife comes out clean. Let cool in pan and then turn out. 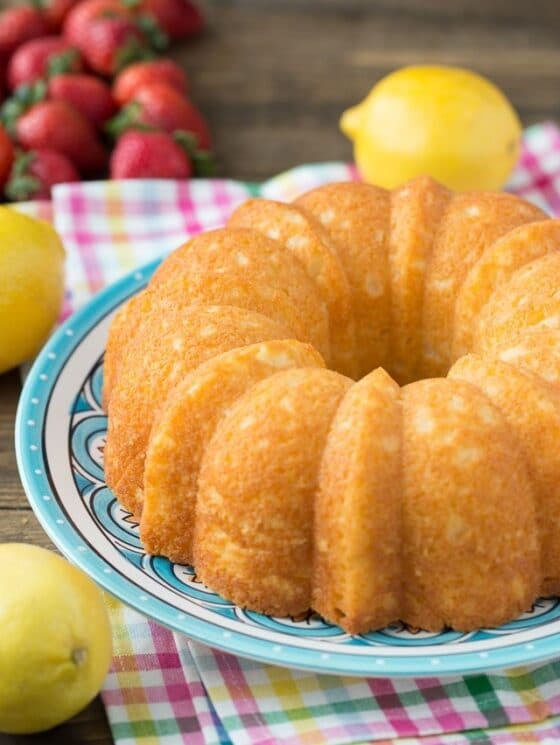 Optiona Lemon Glaze: Combine lemon juice (about 2 tablespoons) and powdered sugar (2 cups) and whisk until smooth. Adjust as needed. 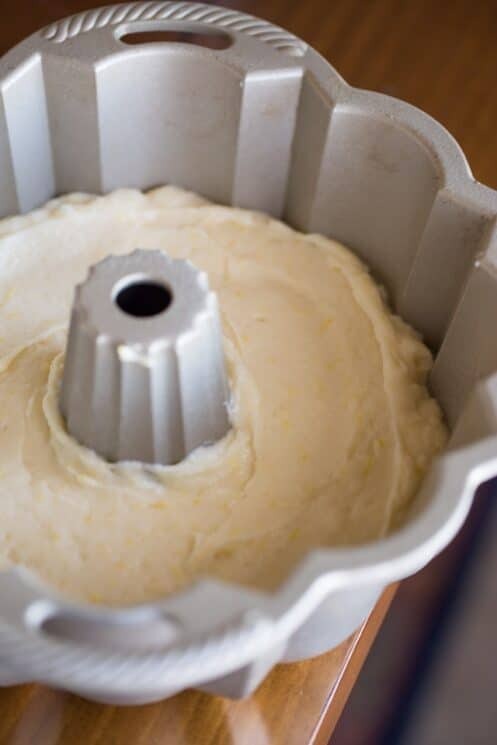 Pour over cooled cake! When me and my sister started this recipe we were so glad to make this dessert to fulfill our holiday spirits.There are some healthier aspects to this recipe but still incorporates a high amount of sugar. When doing this recipe it took way too long for use to grader the lemon zest to 2 tablespoons.When mixing the wet batter it had massive chunks and clumps of Greek yougurt and sugar.Also the flower to liquid ratio was way off.Much more liquid was involved then dry mixture.The outcome of the cake was very dense with stiff edges.The sugar and honey was crystalized causing the rough edges. It was also way to dark than the image provided.